Habit: Plant 6--25 cm. Leaf: blade 1--4 cm, base cordate. Inflorescence: 2.5--4 cm. Flower: sepals 2--4 mm, oblong to narrowly elliptic; lip 8--10 mm, oblong below middle, with 2 short teeth at base, deeply 2-lobed; column 0.5--1.5 mm. Chromosomes: 2n=36,38,40,42. 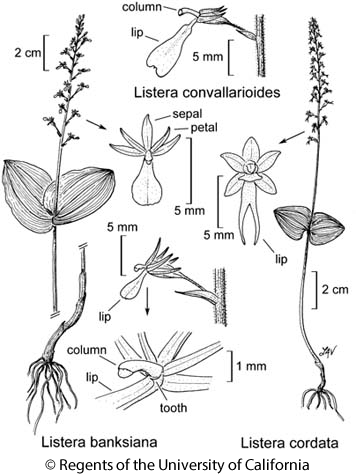 Synonyms: Listera cordata var. cordata; Listera cordata var. nephrophylla (Rydb.) Hultén; Listera nephrophylla Rydb. Citation for this treatment: Ronald A. Coleman, L.K. Magrath, Dieter H. Wilken & William F. Jennings 2012, Listera cordata, in Jepson Flora Project (eds.) Jepson eFlora, http://ucjeps.berkeley.edu/eflora/eflora_display.php?tid=31225, accessed on April 19, 2019.